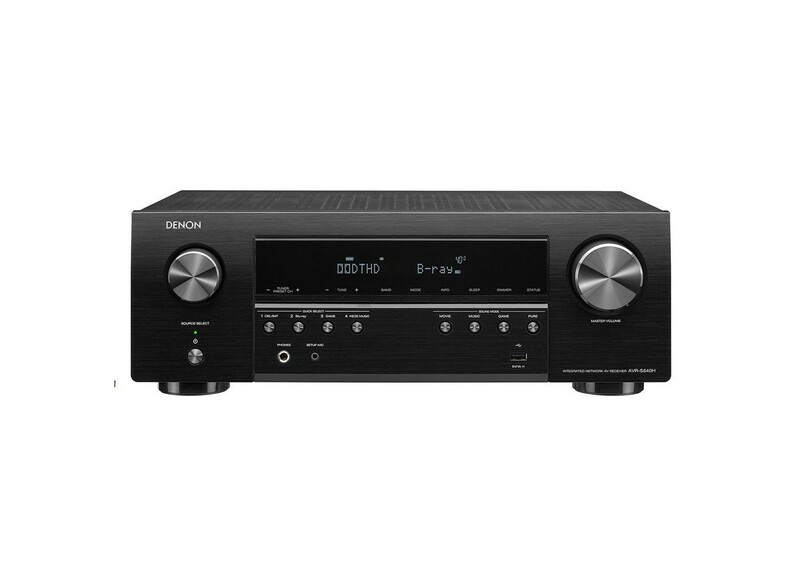 The 5.2 channel Denon AVR-S640H AV receiver features Dolby Vision, HDR, HLG and 4K video upscaling for a stunning home theater experience. It includes 5 HDMI inputs at 4K/60 Hz with full-rate pass-through and HDCP 2.2 support on all HDMI ports. Built-in HEOS lets you stream Spotify, Pandora, Tidal and more throughout the home. A front-panel USB offers convenient audio playback of MP3, WAV, FLAC, ALAC and DSD (2.8/5.6MHz) files. Control your AVR with Amazon Alexa voice compatibility and with our award-winning Setup Assistant, the Denon AVR-S640H is just as easy to setup as it is to enjoy. Control the AVR hands-free with Amazon Alexa and your voice. Adjust the volume, skip to the next track, switch inputs for your different media players and more — “Just Ask.” Download the HEOS Home Entertainment Skill to enable Amazon Alexa voice commands for your AVR-S640H, HEOS devices and other select Denon products.